For 26 years, Jane had suffered and struggled with her skin. It started with a surgery so severe in 1989, she had inflammation of the gall bladder/gall stones, and a stone blocked the pancreatic duct, causing the pancreas to be backed up; started eating itself with the fluid, resulting to damaging the pancreas. With the pancreas damaged, the pancreas does not produce insulin, which furthermore adding to her struggle with diabetes. The Inflammation of her skin due to rocacea, causing the blood sugar to react, was lowering her blood sugar. Right after her surgery, Jane fell into a coma state. The surgery and other health complication had triggered the rosacea and eczema. Over the years, Jane had tried everything; the doctor prescribed topical therapy for her. Metro Gel and Cream only soothed the skin but did not cure her. Cortisone cream thinned out her skin, but it eventually stopped working after 2-3 days. Finally, the specialist suggested for her to try Pine tar (black) bar, which only healed her eczema but not her rosacea. Advising her to stay away from acid, sweet, citric fruit, spicy food and alcohol. On November 23rd, Jane came in for her hair appointments. Jane was quite sluggish, but listened attentively with our new products. At this point, you can hear the desperation in her voice. “I will try anything, it wouldn’t hurt to try”. In exactly 6 days, not even a week, Jane came back in with big bag of kiwi that she plants herself and handed the bag to Diane. She was absolutely glowing with excitement. She stated that her skin had reduced stinging/burning and did not have to use the cold packs. January Newsletter 2013, we wrote an article our client Jane and titled: “Rosacea Here’s My Story”. On March 1, 2013, we spoke to Jane and asked her to give us an update regarding her skin’s progress. As you can see on your right diagram, her skin has improved based on the before and after pictures. It’s been 13 weeks since she last purchased the Methode Relaxante Skin line, and she reported that her skin; no more peeling and flaking. Color of her skin has improved. Her doctor is asking her what products she’s been using and requested more information to recommend to her patients. 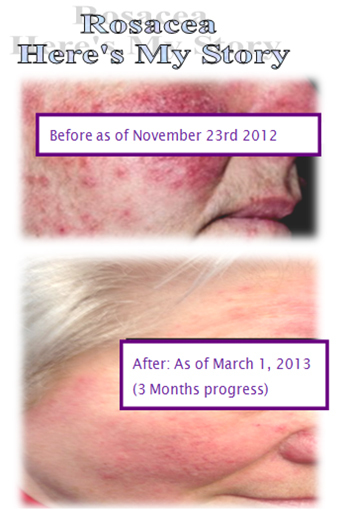 We are so pleased to let you know that Jane is doing very well overall health and skin. Copyright © Master's Touch Hair Salon.